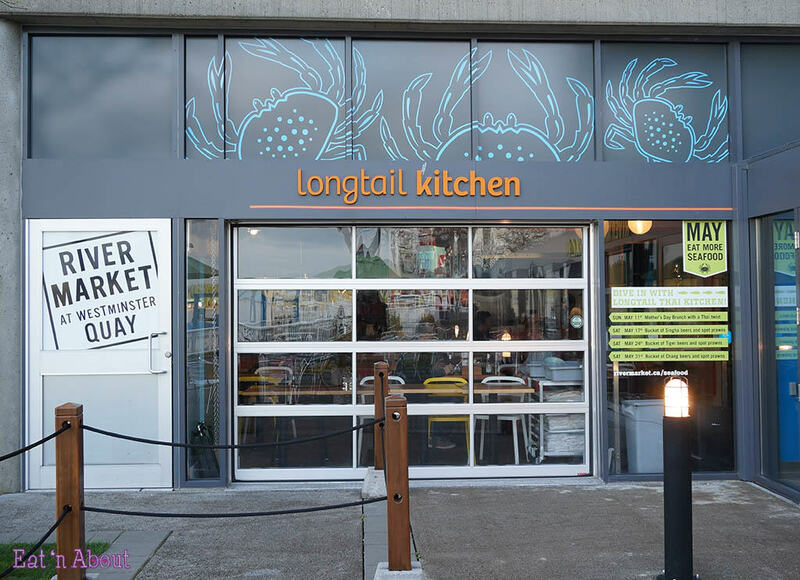 Longtail kitchen is an offshoot of Angus An’s Maenam restaurant, created to serve Thai fisherman’s comfort food and Thai street food. The design is loosely based on Asian night markets, and features reclaimed wood and paper lanterns. 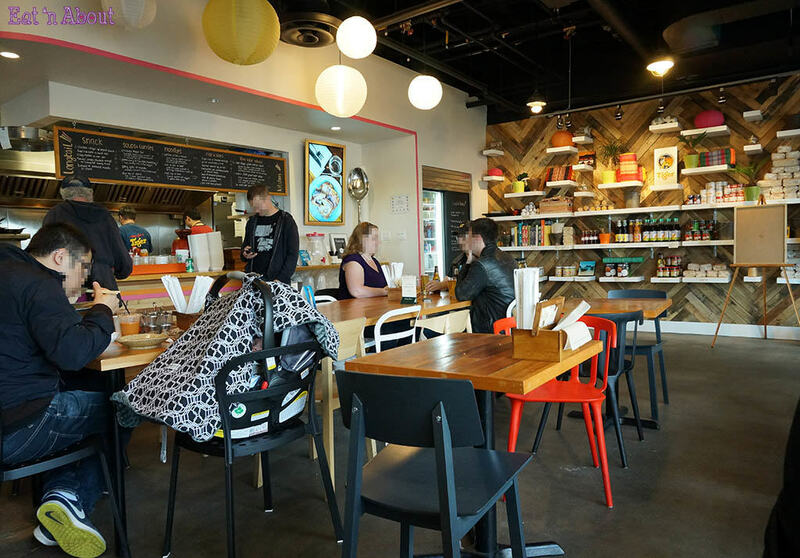 The interior was bright and funky, with an open kitchen behind the counter where you place your order. There was also a wall lined with groceries for sale and other neat odds and ends like cookbooks and mortar and pestles. I really like it when ethnic restaurants have these little sections to explore, and especially when you can buy some of the homemade ingredients that go into the dishes being served. In this case, you can buy longtail kitchen’s own “Blue Tongue Chili”, but more on that later. We grabbed ourselves some drinks out of the self-serve fridge. Wendy got the very last Thai Iced Tea so I guess this one’s a popular choice, and I grabbed the seemingly less-popular Lemongrass Pandan drink from a fully stocked shelf. 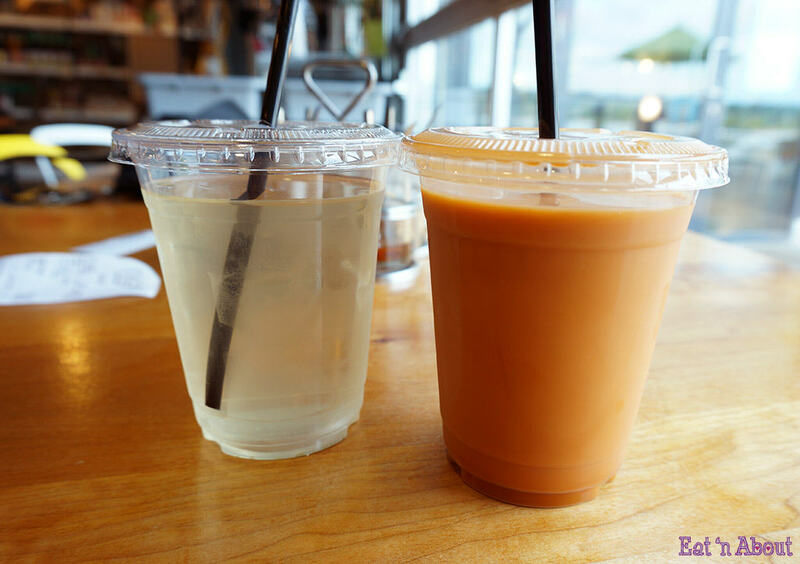 I’d list the drink prices here if I could remember them; longtail kitchen’s online menu lists the Thai Iced Tea at $2 but the menu seems to be out of date. Many of the prices on it have gone up and down by $1 or so and menu items have changed, etc. I’d never tried pandan before. The pandan’s intensely tropical flavour gets in your nose so you can “taste” it as you breathe out. The closest comparison for this drink would be coconut water, but with more flavour. The pandan lemongrass drink went swimmingly with the spicier dishes and Wendy had the bright idea to try making it at home and add some ginger to the mix. We’ll post a recipe if it turns out. Wendy found her Thai Iced Tea to be a little mild. It had the colour but lacked the oomph of the one she had at Sabai Thai. Okay, this was just gross. Clean up your act longtail! It’s one thing to ask customers to bus their own tables, but send someone out from behind the counter once in a while to wipe things down! 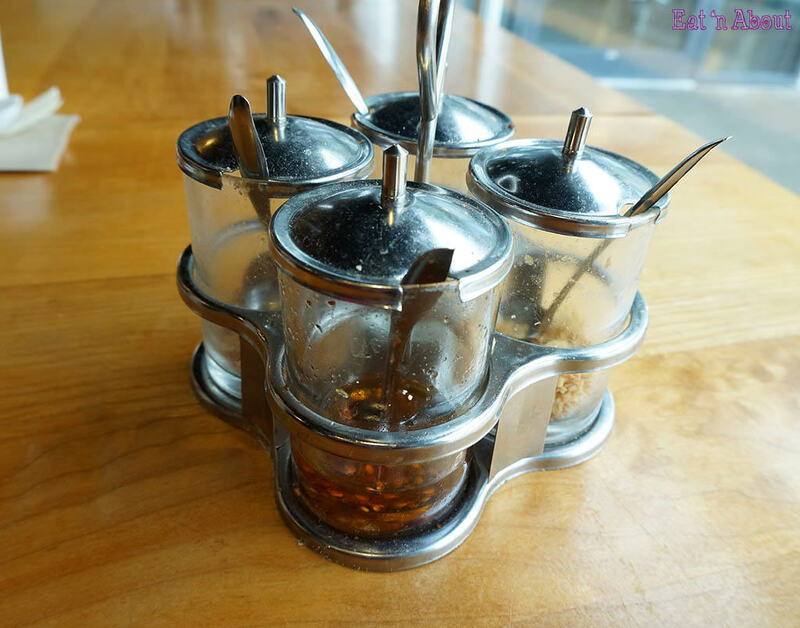 These condiments were a filthy, sticky, dusty, and nearly depleted mess. I’m not much of a wing-man. In fact, when I met Wendy I barely knew how to eat a chicken wing, leaving what was in her eyes an unacceptable amount of meat on the bone. I’ve gotten better with her mentoring, but I still don’t get the fuss about wings. 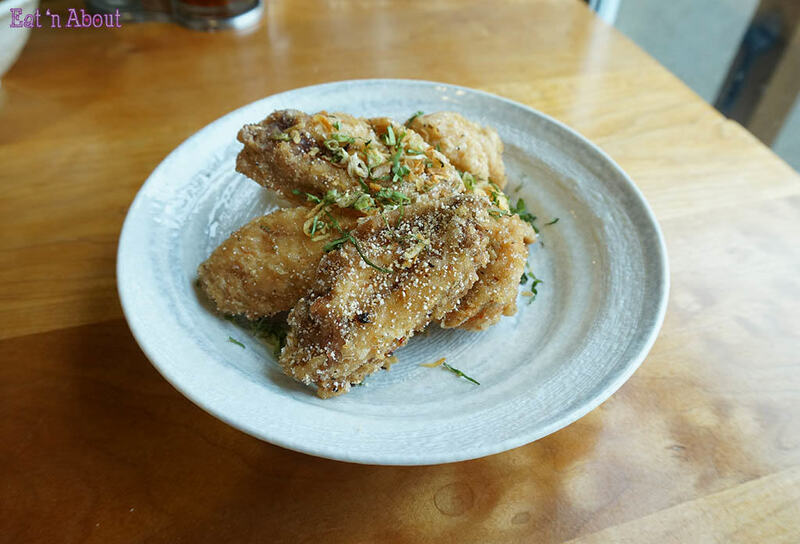 After trying longtail kitchen’s Famous Crispy Chicken Wings ($8) though, I finally got it for once. Man, did these rock. Sweet and salty, crispy and juicy, with fried shallots, green onion, ground peanuts, and cilantro. The chicken wings were great on their own but the tamarind dipping sauce they came with really put them over the top with its sweet tangy zing. “Best wings EVAR!” for me. Wendy liked them too but still prefers Wo Fung’s wings at Aberdeen. She likes marinated wings better where the flavour is imparted deep into the meat, whereas with longtail kitchen’s wings it was all in the skin. In the end, it’s just a matter of preference though. Longtail kitchen apparently specializes in Thai street food offerings, and from my experience som tum is among the most popular of these. 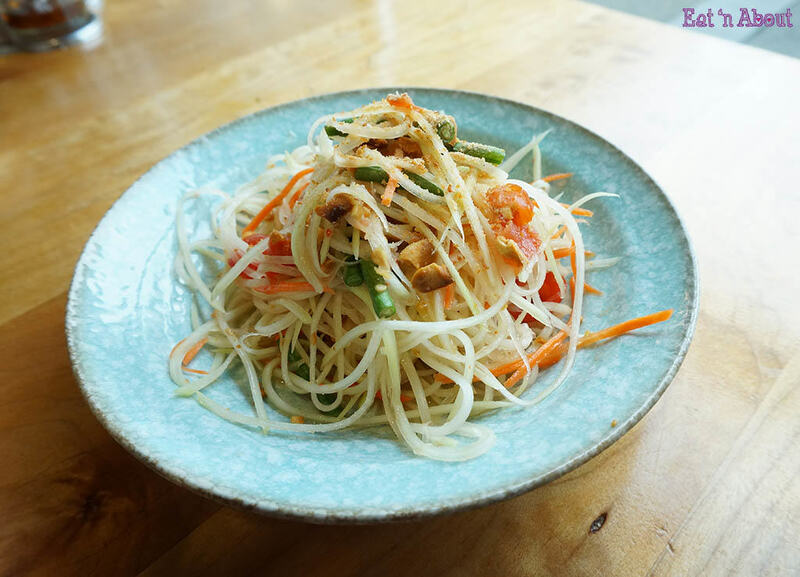 It’s also at the top of my list, so I had high hopes for the Som Dtom Green Papaya Salad ($7). Unfortunately I wasn’t overly impressed with it. It looked bland and mild at a glance, but looks can be deceiving and it was actually fairly spicy. Nowhere near Thai levels—we’re still safely in farang-style territory here—but they offer chili on the side to account for that. It was missing the sweet and sour fishiness of a proper som tum though and was pretty one-dimensional in my opinion. Wendy didn’t like it much at all. 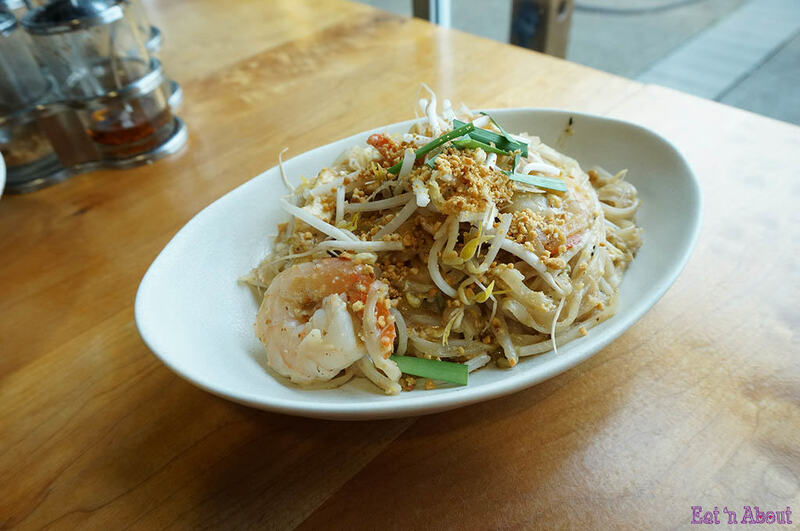 Another street food fave, the Pad Thai w/ Prawns ($12). The classic Thai rice noodles were fried with tofu, shallots, egg, bean sprouts, and 3 large prawns, then caramelized with tamarind. This dish was pretty drab looking and a bit plain-tasting also, but tasted much better when I added the aforementioned blue tongue chili. No, it doesn’t actually turn your tongue blue and to me it tasted like any other dried bird’s-eye chili. The addition of extra spice took the Pad Thai from a low 6 to a mid 8. I was glad for the relative mildness of the som tum between fiery bites after dousing my Pad Thai with chili. It’s not often that I get to eat Myanmar’s cuisine, in fact the only other place I’ve had Burmese food is Laksa King. So I jumped at the opportunity to try longtail kitchen’s Chicken Khao Soi ($12). 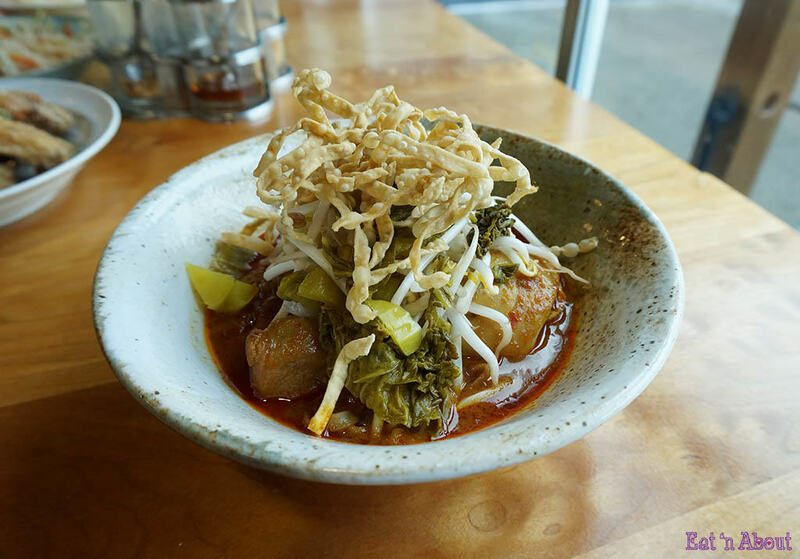 Khao Soi is a Burmese style curry dish with boiled and fried noodles, pickled mustard greens, bean sprouts, and roasted chili oil. This one comes with a chicken leg and thigh in it. A fairly sweet curry, the Khao Soi was very coconutey and tasted of the tropics. The chicken was so tender I cut it with the flimsy plastic spoons that serve as longtail’s cutlery. The sour mustard greens went well with the other aspects of the dish. I really liked this one, scooping up the remaining sauce by the spoonful at the end. I should add that the service at longtail (what little of it there was due to the setup) was quite friendly and helpful.